Ah, yes. I think we may have discussed this toy before. Nevertheless, The Lotus Esprit was my favorite car for quite some time after seeing The Spy Who Loved Me. I was totally obsessed, going to my local library and hunting down every single Road & Track or Car & Driver magazine which featured one in its articles and/or reviews. I tried memorizing all the technical stats on its engine, top speeds, etc. ; in fact I think that was the first time I memorized the term DOHC without even knowing what the heck it was. Man, what a geek. I did see a few Esprits on the Westside (of course, the Beverly Hills area) back then. Most of them were that racing yellow, then there were some red ones, but the least common (that I saw) were the white ones like in the movie, which I thought was weird. I could not believe how low to the ground they were. When we pulled up next to one in my dad’s ’72 Dodge Dart I swear the Esprit’s roof was lower than, or maybe about level to, our car window (the bottom-most part). So needless to say, I was overjoyed when my parents gave me money to buy that Corgi toy at Toys ‘R’ Us. It was great fun for awhile, but it didn’t take long for me to wish that the car could do a full transformation from normal car to submarine. You had one too? 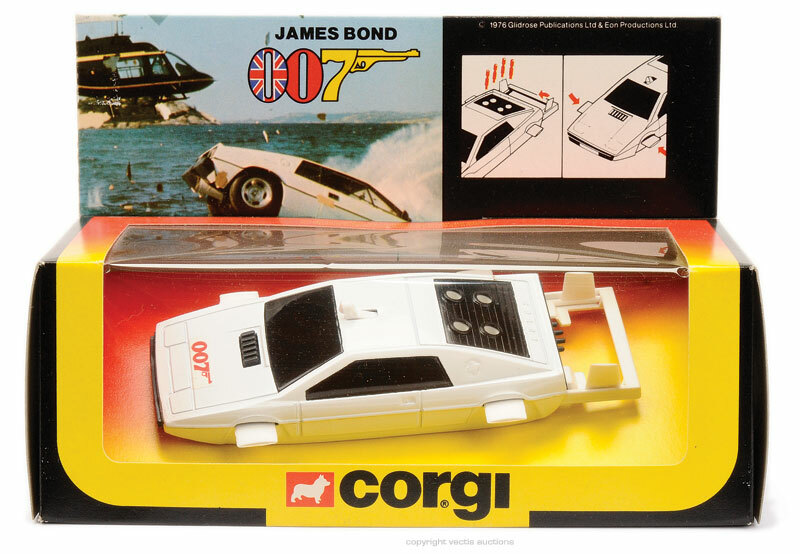 I had one, but I probably got mine from the Corgi Moonraker line. The car wasn’t in Moonraker, but what the hell? I had the Moonraker Space Shuttle as well. LoL, did they try to do a crossover? I vaguely remember the Moonraker Space Shuttle. I still got mine, and all of my other die cast cars.